Stay at home mommy of 2 amazing girls For what these are (disposable party hats), they are impressive. They added a lot to my daughter's Bob the Builder Birthday party. They would work alone, but were even better after I added decoration to them (pictures of Bob, Wendy, and "[Child's name] the builder" stickers). Although they are disposable, they lasted us many hours of play (almost a whole year). 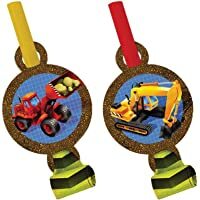 From the Under Construction Party Supply Collection. Under Construction Blowouts 8 Pack. 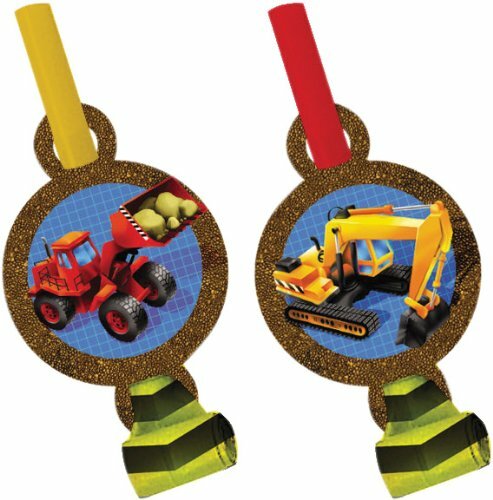 These red and yellow blow outs feature a medallion with either a bulldozer or a backhoe. Each package includes 8 party blowouts.